Kaiten-style sushi bar has unusually high quality, low prices and a family-friendly atmosphere. 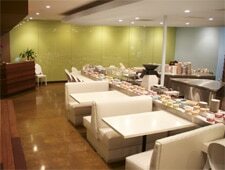 : Sushi aficionados usually think of kaiten (conveyor belt) sushi bars as lowbrow with low quality and low prices. Not so with Sushilicious. Innovative proprietor Daniel Woo has brought unexpected high quality ingredients and master sushi chefs to his post-modern kaiten sushi restaurant in Irvine. Sit down at a booth or at the bar and relax as super fresh sushi items pass by on a conveyor belt. The color-coded plates denote the price. We enjoyed the salmon skin salad, colorful rainbow rolls, straight-from-Japan octopus and spicy green mussels. There’s also a quick bento box meal, which includes miso soup, teriyaki-style meat, rice, salad and tempura vegetables. Want something you don’t see on the conveyor? Ask the chef to make your favorite sushi roll or call over a “concierge,” who will answer all your questions. At meal’s end, count up your plates and determine the bill. Before you get the final count, however, grab some sweet tofu (inari), green tea tiramisu or cream puffs for dessert with some hot tea. Want a deal? Come before 2:30 p.m., and you can eat five plates for just ten bucks.